(Jamal) is a pianist who never played a cliche (or anything approaching one)...Forget the term "small-group jazz." The relatively complex structures and the dramatic shifts in dynamics, rhythm and mood made this "mini-orchestra jazz." "While the majority of jazz pianists make occasional visits to the edge, peer over, and then scurry back to safety, Ahmad Jamal lives there. With stream-of-consciousness logic, Jamal reorchestrates conventional tunes, fracturing rhythms and harmonies with gleeful abandon." Ahmad Jamal (www.ahmadjamal.info) is a true original, one of the greatest living jazz pianists. Yet for some strange reason, Jamal's work has been undervalued compared to more popular icons of the jazz keyboard. Perhaps his image as a pianist was flash-frozen by the mellow, laid-back majesty and telling silences of his famous late ‘50s performance of "Poinciana" (from Live at the Pershing & The Spotlight Club, now available on Jazz Hour/Qualiton), but this stunning new recording should go a long way towards hipping people to the breadth and depth of Jamal's vocabulary. In Search of…Momentum is a superbly recorded recital, done "live" in the studio employing a TL Audio Vacuum Tube Console (www.tlaudio.co.uk) and an Otari Radar 24-bit digital recorder (www.otari.com/products/RADARII), that showcases Jamal's expansive arrangements, commanding orchestral pallet and mastery of the trio format (featuring the great New Orleans drummer Idris Muhammad and bassist James Cammack) in a dizzying array of rhythmic/harmonic settings that gravitate somewhere between dancing celebrations and fulsome big band exultations, encompassing the entire history of jazz piano. On an all-encompassing performance such as "You Can See," Jamal's sets a lot of elements in motion: wonderful moving bass lines, punctuated by massive two handed block chords; then Jamal begins breaking down the rhythmic impulse into rocking vamps and swinging riffs, only to soar freely above the fray in a seemingly disconnected collage of consonant and dissonant ideas, alternatively dense and spare, voiced in brassy chorales and a spare tinkling of bells aglow in silence, when suddenly, BANG!! !Jamal calls home the rhythm section with some convulsive, conclusive idea that reaffirms a sense of order…and being. As modern as all get out, yet deeply rooted in the two-handed, ten fingers play the whole damn keyboard Harlem stride milieu of founding fathers such as James P. Johnson and Willie "The Lion" Smith. The late vocalist O.C. Smith contributes a lovely cameo on "Whispering" and the manner in which engineer Paul Orofino depicts both the sound and capacious physical dimensions of the grand piano will be of particular interest to audiophiles and jazz fans alike (www.dreyfusrecords.com). The Dreyfus label is distributed in America by Koch Entertainment (www.kochint.com). "1. 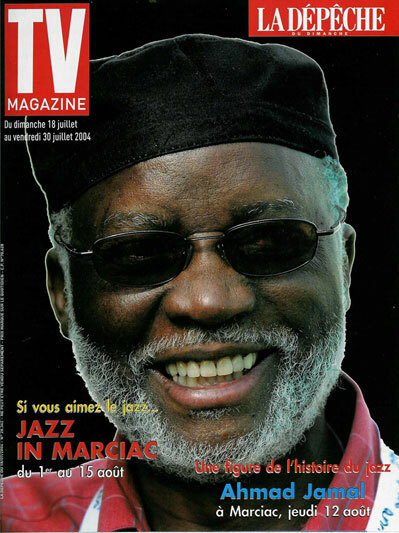 Ahmad Jamal: "The Essence, Part 1(Verve). The rows of shocking diversions and risks on this new album by a 1950's master could be mistaken for the work of a younger, experimental-minded pianist." "No musician has had a more profound effect on the orchestral approach to small groups in the last 35 years than Ahmad Jamal...He showed people how to italicize and magnify elements of music that were taken for granted, how to organize the sound of a group around the drums and how to interchange the riff with the ostinato or the vamp...He is a virtuoso, but his innovations are found in his arrangements...."
"Ahmad Jamal is. to me, the most exciting, creative keyboard artist living." "Given [Miles] Davis's great influence on other musicians, the cumulative effect has been incalculable; not only pianists with Miles, but everyone who has imitated them as well, reflect the works of Jamal to some degree." "Jamal's principle contribution to the history of jazz is the trio. He brought a new concept, creating a form of collective improvisation that had a suppleness without precedent. "Ahmad Jamal behaves like a true orchestra conductor. 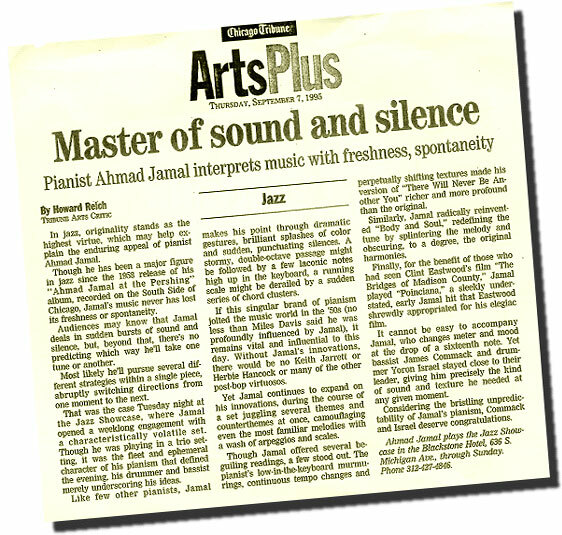 ..astonishing in a jazz trio!...Ahmad transforms himself into an enchanter of the keyboard--in the blink of an eye an allusion to Liszt or Debussy, marvelous versions of Coltrane, delicate pearls of melodies recreated at each touch, turbulent, orchestral, riding on incandescent rhythms." "Jamal's colorful harmonic perception has been too often overlooked. He characteristically builds parallel and contrary motion lines that move in and out of chordal substitutions and alterations that would probably frighten pianists of less harmonic senstivity...In his use of pedalpoint ostinato interludes as a method by which to build and release energized musical tension, Jamal has brought the bass and drums into an independent but highly functional role in his conception of the piano trio. He has always been one of jazz's foremost exponents of good songs." "He has clothed the very avant-garde things he does with subtlety and a sound that entices the average jazz listener, rather than making him unconfortable. "Mr. Jamal, 66, is one of the figures that looms over the younger generation...he set an example for changing tempo and rhythm from which the younger musicians have borrowed. 'The Essence, part 1' is one of his best recordings in years..."
Ahmad Jamal is never banal. "Much of Jamal's music has almost a classical feel. His fluid runs up and down the keyboard owe as much to Horowitz as they doe to Teddy Wilson. He arranges his tunes in clearly defined sections, with sudden shifts in dynamics and tempo, and he directs his quartet as if he were conducting an orchestra...The true test of a musician, or any artist for that matter, is he compels your attention. Jamal makes you sit forward because you want to hear what comes next." "a soloist who defies practically every convention of the jazz pianist's art. This is a man uninterested in playing easy backbeats while his sidemen indulge in extended solos, a musician whose mercurial improvisational techniques require an unusually nimble set of fingers...Startling chord clusters, outrageously elastic tempos, sharp dissonance between the hands, rhythmic ideas that ignore the meter of his sidemen--Jamal reveled in defying conventional approaches to the keyboard...the pianist manages to bring coherence to improvisations that shift constantly between swing rhythm and meterless playing, between single-note riffs and extended parallel chords in both hands." "...the most architectonic of piano trios, perhaps the first to really explore the sounds of silence and make them sit up and sing." "...after I heard Ahmad's gig It really inspired me as to what jazz is really about (he does a lot of avant-garde things now, but never sacrifices the groove). I'm still feeling that gig..."